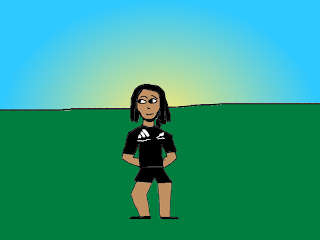 Passionate about their Haka the All Black warriors frightened South Africa. As they were about to battle. 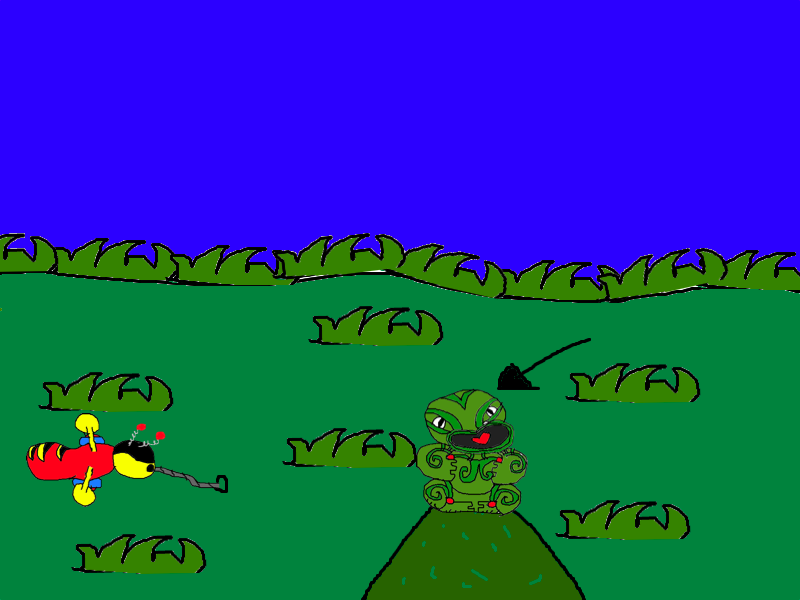 South Africa was intimidated by the warrior’s strong and powerful fierce war cries. 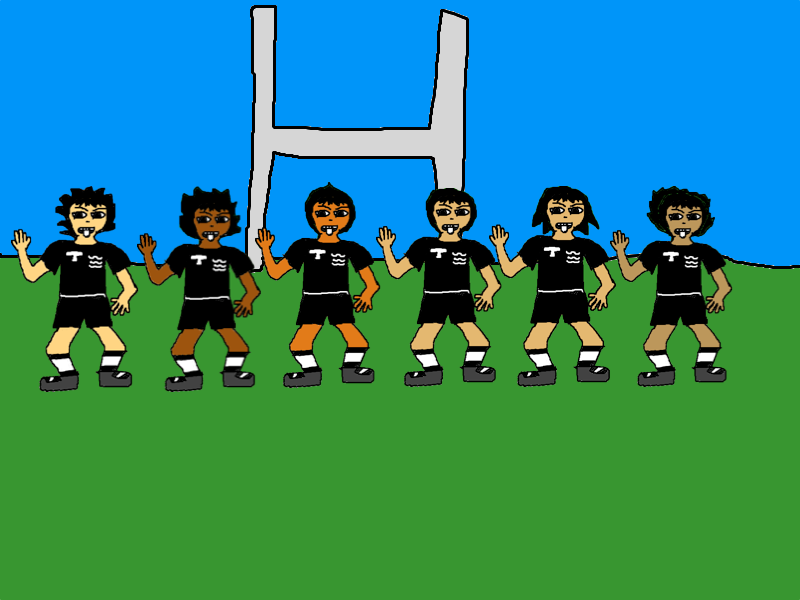 The All Blacks threatened them with their throat slitting action. Piercing screams were heard by the crowd as The All Black. 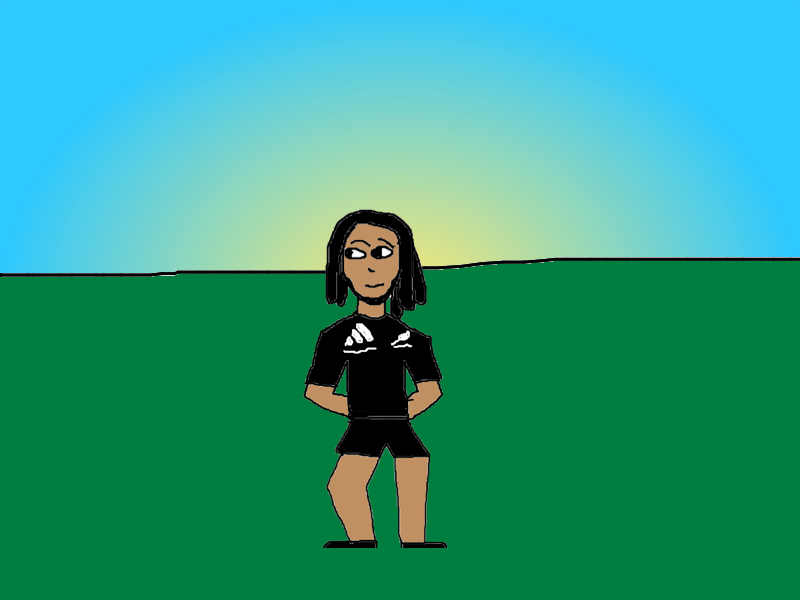 Ma’a Nonu, the mean machine Rugby player weaved his way to the opposition’s goal. Players bounce off as he barges through like a charging bull. His great skills helps him sidestep and quickly run away with the ball. Fast and furiously, he dodges the players and runs for the try line. Donna from Sport Auckland came to teach Room 13 and other classes to play a game that I haven’t heard before. Badminton, that’s right Badminton. 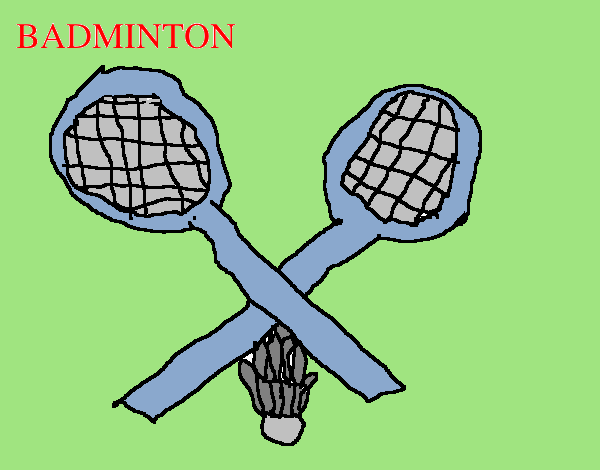 It’s like tennis but it’s not, this sport has a something called a shuttle. With it’s feathers on it, it can fly like a bird but there is a heavy part on the shuttle that helps it come back down. Anyway on to the playing. “Okay, we are going to play Badminton soccer, so grab a partner”, Donna said. After Donna explained the rules we began to play. Severing the shuttle I powerfully hit it and up it went, into the air. As it came down, my partner (Ana) used hand eye coordination to hit it back. Swinging my racket I noticed that I was going to miss. Ping! went the shuttle. A goal was given to Ana. Ana served it this time but I was determined to hit the shuttle and score a goal. My hopes were up she used quick body movement and was able to hit it back. The shuttle came to me so I hit the shuttle to the target (Ana). Soaring through the air the shuttle flew back and fourth between my partner and I. Concentrating on the shuttle I used the underarm grip and manged to hit it back to Ana. She missed and I got a goal. After that game we played more exciting games but that is going to have to wait for another time. Regular meals like healthy snacks give children enough nutrients and energy and helps them to grow and learn. The variety of the essential balanced diet has four main food groups. One of them are Breads and Cereals. There is also Fruit and Vegetables, Milk and Dairy Products and last but not least Meat and Fish. Milk and water is the best choice to drink. High sugar fizzy drinks and acidic juices are best for treats. Fats and sugars are not the best choice but it is alright to eat, but not to be eaten too much of. Right food choices equals a happy and healthy life. A healthy diet helps your body to work in the right way. 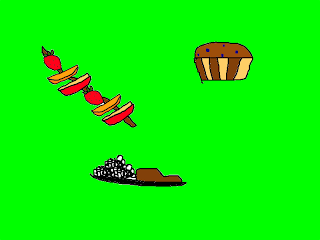 This voice over and picture tells you that you should eat the right food and snacks. My picture has two sides. 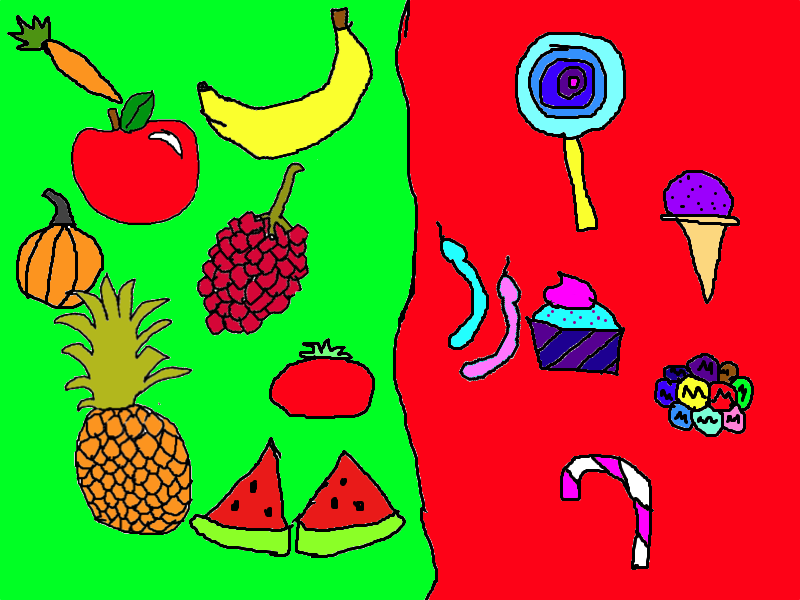 One side is coloured in red and the other is green. Red means stop and green means go, just like traffic lights. 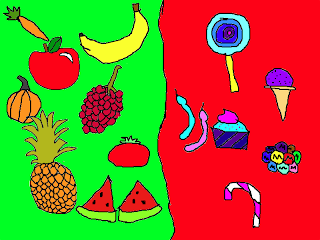 My voice over explins that you should eat Vegetables, Dairy Products, Fish and Meat and last but not least Fruit. Hope you enjoy. 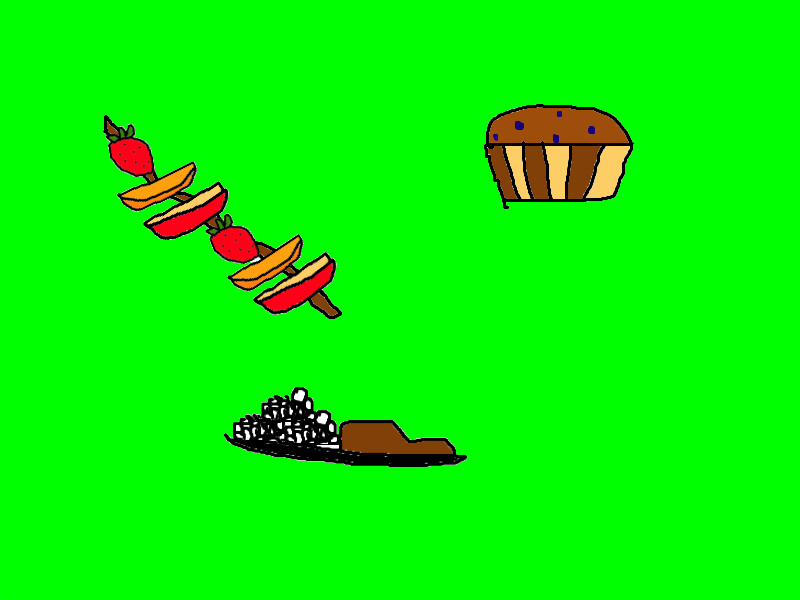 Here is a movie made by Thea, Kashya and myself. It is about Maths Stratgies. I hope you enjoy and hope this helps you too. New Zealand is very different to other countries. This special country has a multicultural population. Many many years ago Australia and New Zealand used to be connected, now it is isolated. Our kiwiana is special, important and unique to us. Buzzy Bee is a very popular toy in New Zealand. This bee figure is very precious to the children in New Zealand. In the late 1930s the Buzzy Bee was invented in a small workshop which was in Auckland. The brightly coloured wooden pull along toy has been passed down from generation to generation and now it is a New Zealand icon. 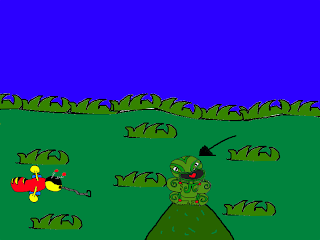 The tiki (tikitiki) is a carved human figure made out of green stone also known as pounamu. But green stone isn’t the only object used, bones are also includes in the tiki. It was made by both Moari and Polynesians. So I hope these facts have helped you find more about New Zealand. New Zealand has many treasures so maybe you can find out more. 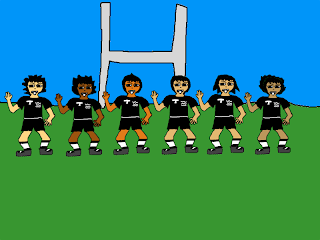 Thank you and GO ALL BLACKS!!! Step 1 Remove fromage frais from fridge to sit before use. Peel kiwifruit. Cut all fruit in bite-sized chunks. Step 2 Divide fruit evenly among skewers. Step 3 Place chocolate chips in a pan and heat until melted. Stir in fromage frais and pour into a dipping bowl. Serve with fruit skewers. That was easy. Okay, time for a lunch recipe! Hope you enjoy it. Preheat oven to 190°C. Lightly oil muffin tins. Place sifted flour, bran, salt, cinnamon, sugar, blueberries and mashed banana into a bowl. In a separate bowl or jug, mix together the milk, baking soda, egg, vanilla and melted margarine; add to the other ingredients and mix until just combined. Spoon batter into muffin tins; place in oven and bake for 18-20 minutes or until a skewer inserted comes out clean. Step 1 While dough is rising, prepare topping. Pound garlic, oil and rosemary together, then brush lightly over sliced vegetables. Grill vegetables until tender. Set aside. Heat a baking tray or pizza stone in an oven set to its highest setting. Step 2 For lamb, heat mince in a non-stick pan. Add onion and garlic. When tender, add remaining ingredients. Step 3 Spread each pizza base with half the sauce, a sprinkle of oregano, half the vegetables and half the lamb mixture. Top with half the cheese. Step 4 Slide pizzas, paper and all, onto a hot tray in the oven. Bake for 2 minutes, then slip paper out from underneath. Cook for a few more minutes, then slide cooked pizzas from oven tray. Step 5 Serve with a mixed salad sprinkled with fresh parsley. Here is a presentation me and Kashya have made together. Hope you like it. 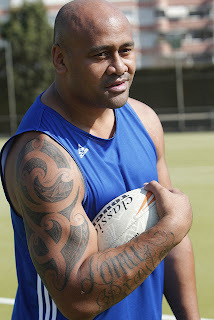 Jonah Lomu, the famous Tongan rugby union player played 63 games for the All Blacks after debuting in 1994. This rugby player was thought of the first global superstar. He was a very intimidating player. His impact on the game was very impressive. Jonah Lomu began dialysis in 2003 because he had a kidney problem. The side effects of the nerve damage could have meant that Jonah ended up in a wheelchair. Luckily for him Grant Kereama decided to donate one of his kidneys. Jonah wanted to go back to play rugby but the doctors told him to quit because of his kidney. He didn’t bother to listen. Back to his job, Jonah Lomu tried to get in back to the All Blacks. He failed. So Jonah tried playing for Wellington and played in Wales plus Hong Kong. Finally he retired in 2007. Football was played in Rugby School between 1750-1869. They were permitted to handle the ball, but they were not able to move with it. Hundreds of players were able to play because there was no fixed limit to the number of players. Major injuries were caused to the players as they played, because tackling was involved and with so many players on the field of course someone would get hurt. In the latter half of 1823 reports came that a 17 year old boy (William Webb Ellis) one day decided to move with the ball to the opposition's goal. This however broke the rules. 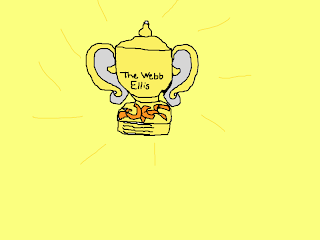 William Webb Ellis had innovated a new version of the game. Every Rugby World Cup the trophy is given to the champion and guess what it is called! 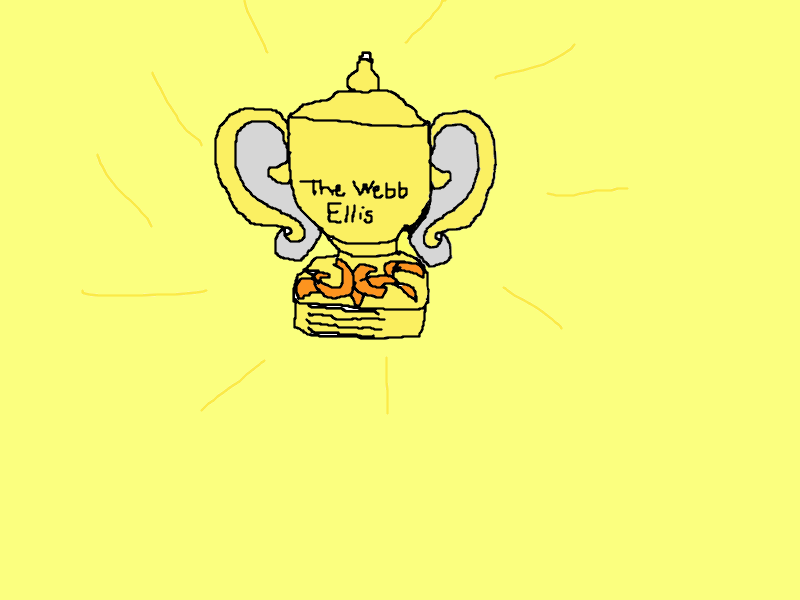 William Webb Ellis!